Island Farm, a living history farmstead, open for the season this week. Island Farm provides a picture of life on Roanoke Island in the mid-1800s, when just over 400 residents occupied the island. Visitors will find wagon rides, a blacksmithing demo, fresh-made corn cakes, and of course plenty of farm animals. Younger guests can take advantage of a large offering of toys and games, including everything from hoop and stick to quoits and tug of war. Clothing typically worn during the 1850s is also available for children to wear during their trip to the farm. Admission to the site is $8 and children 5 and under are admitted for free. Island Farm will be open April through November, Tuesday through Friday, 10 a.m. until 4 p.m., where programming and activities will vary throughout the season. 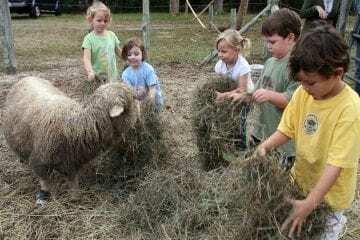 Island Farm is happy to accommodate large tours and school groups, with a reduced group admission rate. The farmstead is located at 1140 N U.S. Highway 64, north of Manteo on Roanoke Island. Island Farm is owned and operated by Outer Banks Conservationists, a 501(c)3 non-profit organization founded in 1980 to protect important natural, cultural, and historic resources along North Carolina’s Outer Banks through education and conservation of a sense of place. For more information, visit www.theislandfarm.com, email islandfarm@obcinc.org or call 252-473-5440.